We seriously had plans to visit a restaurant this day. It’s a restaurant that has the windows the go wide open and that’s why we chose it. It was gorgeous out and when we got there we noticed that the windows were closed. We stood there trying to decide what to do and I finally said, “I’ve read about this great food cart that’s pretty close. It’s too nice to sit inside.” Without hesitation we left and found our way to Gabagool. Gabagool has a N. Beech address, but it sits right on Mississippi Ave. Such a perfect location. It sits with 3 other carts. They have a few tables with a covering and I think Ryan, the owner said they were going to get sides for the tent for the winter. That didn’t matter to us, we were there because we wanted to sit outside on the October evening because it was beautiful and warm. After scanning the menu I decided to order the Taglierini with delecata squash, prosciutto, arugula, roasted tomatoes, topped with a fried egg. Although when I looked at the menu all I saw was fried egg. Seriously, I love eggs. I could eat them 3 times a day. Love them. 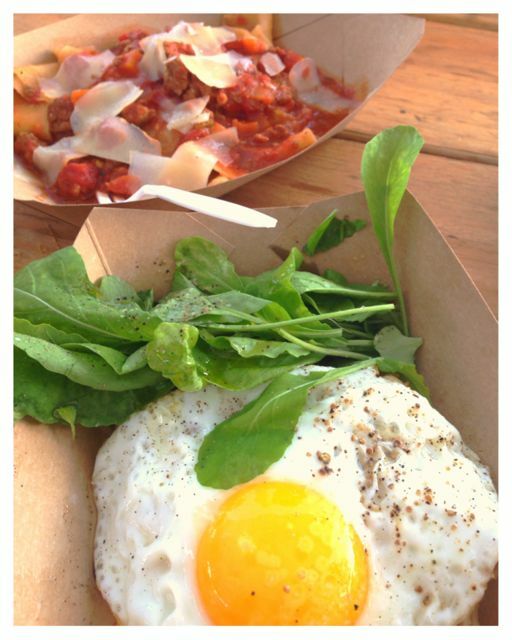 So pasta with an egg? Yes Please! This dish was fantastic! I loved the addition of the slightly sweet delicata. (Yep, delicata has moved up to my favorite fall squash.) 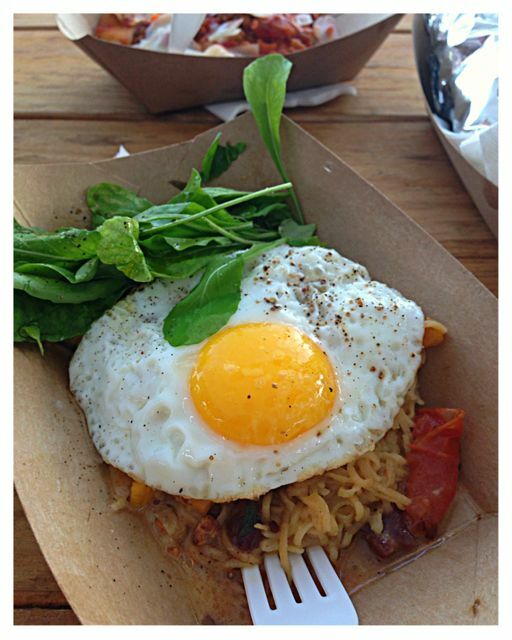 The roasted tomatoes gave it good depth, but the egg, spilling over the dish sent it over the top. I felt like you could experience every ingredient in this dish. The pasta itself, the taglierini, was like an angel hair pasta. I would love to have this again while delecata is still in season. My husband chose the Papparadelle with pork ragu. I love the big thick pappardelle noodles. They soak up all the sauce of the ragu. I love a good ragu and we both agreed this one was done really well. Great flavor in the sauce. I really thought once we ordered these 2 dishes we were done, but my husband wanted to try one more thing. He ordered the Piadine sandwiches, which came with capicola ham, salami, romaine, roasted tomatoes, fresh mozzarella and hot peppers. I wasn’t in the mood for a sandwich. I sometimes don’t want bread, I know call me crazy. I figured it would be nice to try though. I’m a team player, which meant I would help eat it. Piadine sandwich. A Northern Italy treat you must try. The piadine comes out and it’s like a wrap and it’s large. It kind of resembles a flour tortilla, but it’s not. 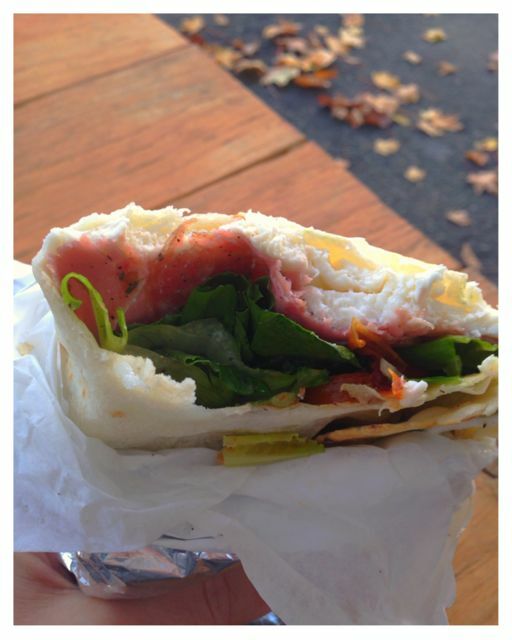 A piadine is much, much better. Apparently it’s from Northern Italy. All I know is that he makes these fresh daily, from scratch. I am so glad my husband ordered on of these. Ours was loaded with thick slices of mozzarella. He didn’t skimp on that or the capicola ham. Perfect sandwich if I do say so myself. This is a sandwich that I would order again. This is a cart you must not miss. We had no regrets in passing up a perfectly good restaurant for a food cart. 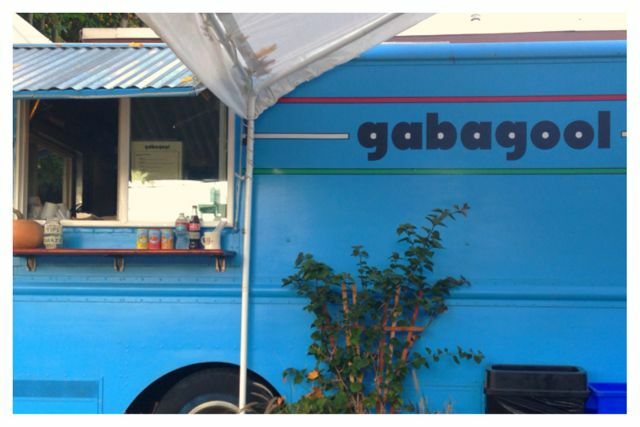 Gabagool is not your typical sandwich, Thai food, Mexican food cart for fast food. Gabagool is competing with local restaurants. Home made pasta, sauces and using locally sourced produce, meat and eggs. This guy is doing it right. It shows in the quality of the food you get. I also loved that the servings were nice sized. They aren’t huge, and we left feeling very full and satisfied. We have been back a few times. 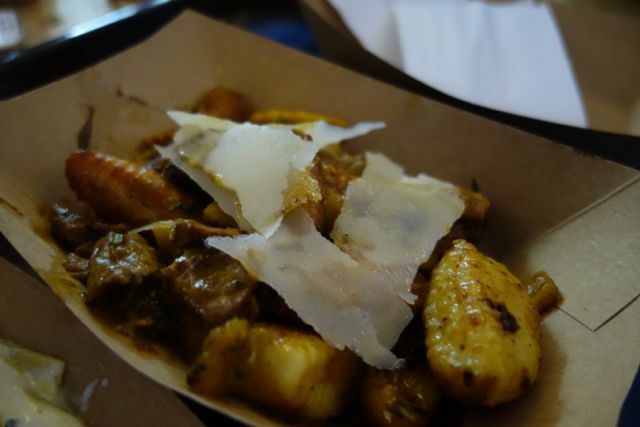 We needed to try the Sweet Briar Pork Shoulder over Gnocchi that we saw posted on his Facebook page. Words cannot describe how good this dish was. You can’t tell by the picture, but the gnocchi was huge, like twice the size of normal gnocchi, yet it was cooked perfectly. 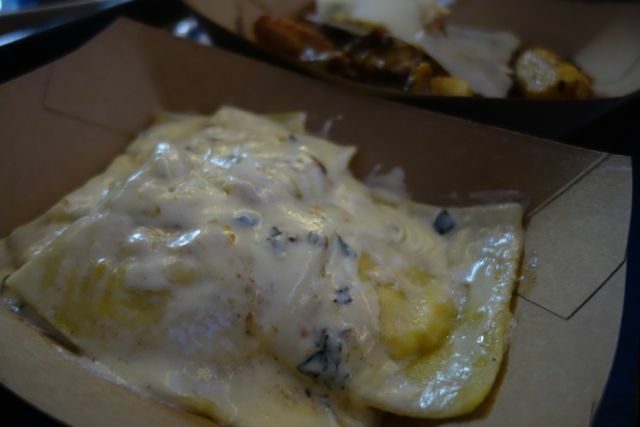 We also enjoyed the root vegetable ravioli in a cream sauce. He has quite a few root vegetables in there, so I didn’t think my family would enjoy this, but in the end we were all fighting over the last bite. Atmosphere is great on Mississippi Ave. There is not a lot going on at the pod, but it provides lots of people watching for sure. Service was great. He was really friendly and helpful. 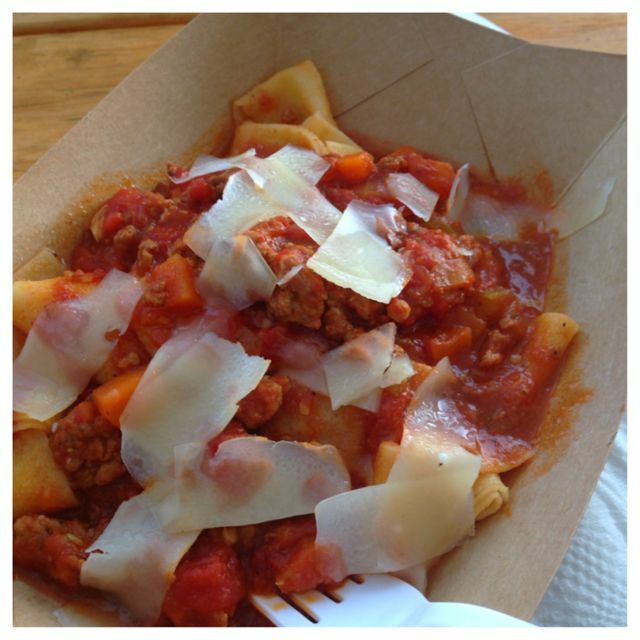 Pricing was about $8-$9 for pasta dishes and $7-$8 for sandwiches. He had a few drinks that he offered, but we also heard you could take your food across the street to Amnesia Brewing and enjoy a beer with your meal. Gabagool is located just off of Mississippi St.